The second day in Kennedy Meadows. I take a well deserved zero. While I’m enjoying a beer and a burger for breakfast at the store, two familiar faces show up. It’s Just Jake and Red Fox. We met before at Sonora Pass, 315 miles back. I’m happy to see them. The southbound bubble is real and happening. And us three are in it! I’m psyched that I get to hike with friends again. We enjoy a relaxed day and evening in Kennedy Meadows, only to be disturbed by an angry young bear who decides to wreck the neighbors shack in the middle of the night. Our host is busy trying to get a permit to kill the animal. Hopefully he won’t have to. On my 3rd oasis day, it’s quite tempting to stay longer, but I hike out. My mailbox with trail food has arrived and I manage to pack my bag top heavy, despite the fact that I can finally send the bear vault back. The next stretch will take us to Tehachapi, 136 miles ahead. Jake and Fox are still busy reorganizing their stuff and I hike out alone. In this way I only have to keep up with my own pace. Just Jake and Red Fox organizing and trying to fit everything in. That night, we camp together, at Manter Creek, the 1st creek in the Rockhouse Basin, only 8.5 miles further. 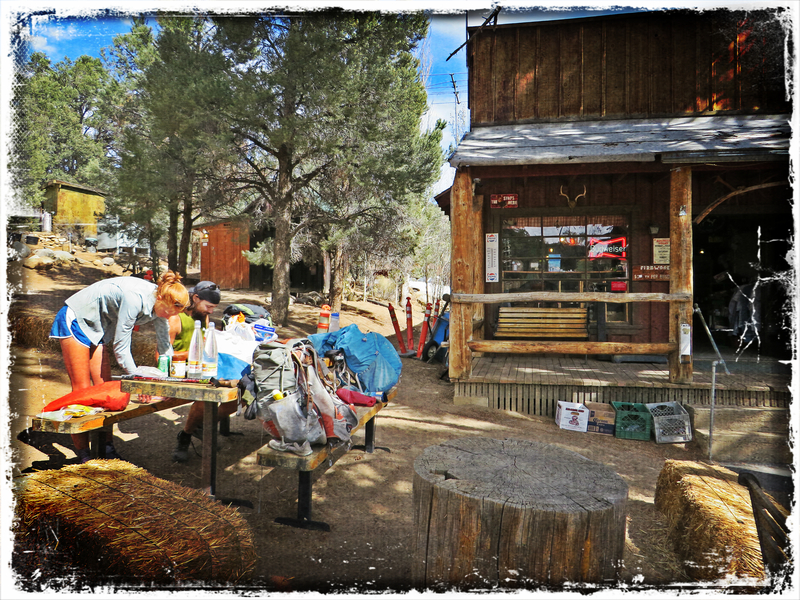 It’s dry in this late season so we carry a generous amount of water with us and have a luxurious dinner with burgers we brought from the general store. Water is scarce, but it’s wifi galore in the desert! So therefor we check pctwater.com as often as we can, a very handy website where the hikers ahead of us have posted status updates on the water situation. At some points, there are even on trail water reports waiting for us near roads we cross. Awesome! The terrain south of Kennedy Meadows. Taking in the stunning views. An on trail water report. Due to the many waterless stretches, we sometimes have to carry enough water to last 40 miles. That’s 1.5 days, in our pace. That’s a lot of water, and weight too. Most springs are dry. 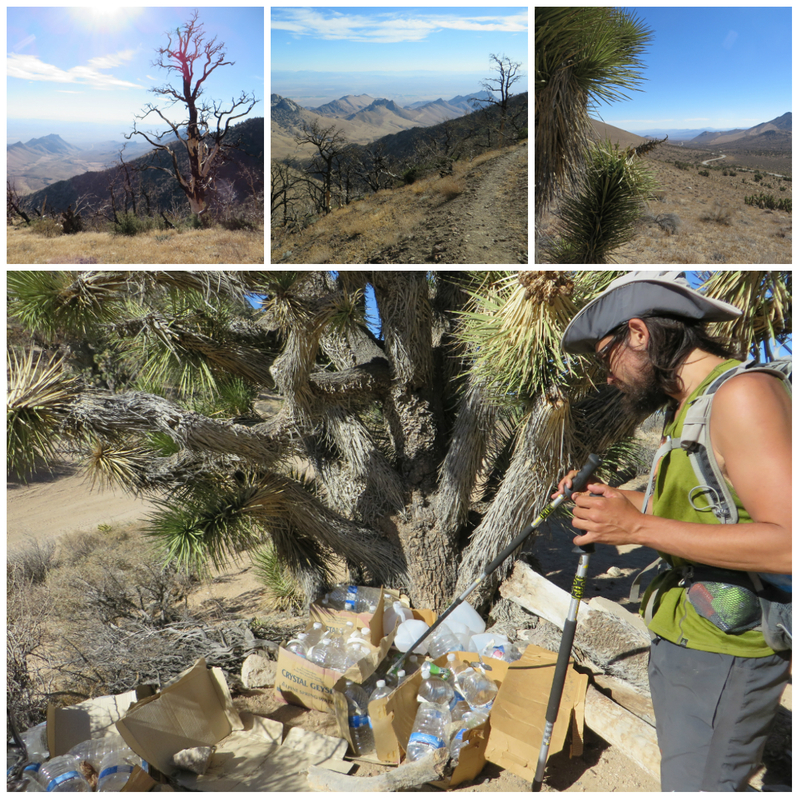 But there are a few water caches, places where trail angels have left water for hikers. Most of them are empty in this late season. 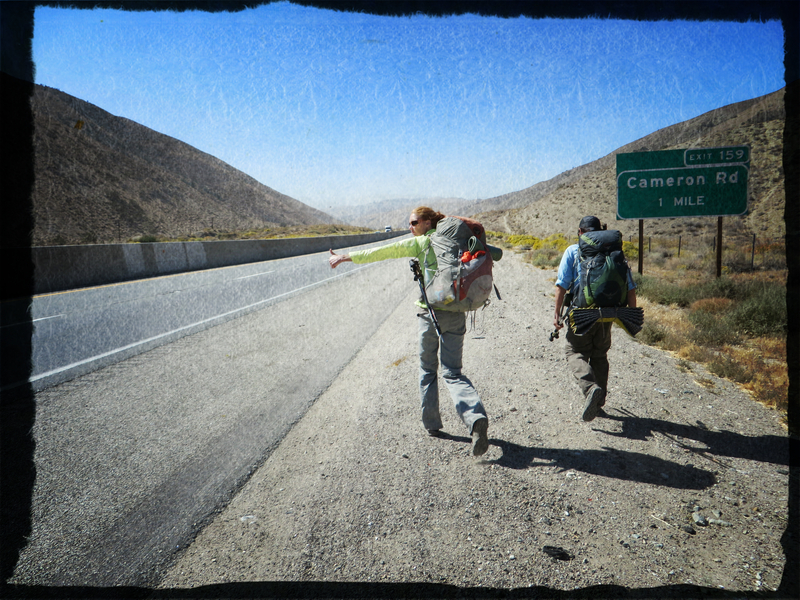 Sometimes we get lucky, like at Kelso Valley Road or Walker Pass, where hikers ahead of us went into town and bought a few extra gallons of water, which they left for us at the pass. Bless them! “Spring is dry 9/6/14”. That note saves us 2 miles of hiking. Dry land. And an empty cache at Bird Spring Pass Rd. 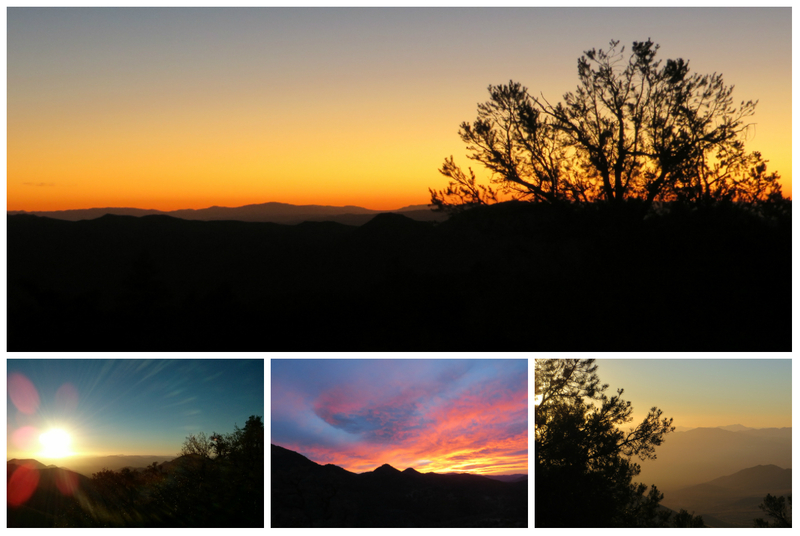 The sunsets and sunrises are stunning. Every time around. Hiking with Jake and Fox is challenging. They are super studs, and hike crazy fast. My strategy is the following: I always hike out first, and I take a 0.5 to 1 hour head start. They have strong legs and always catch me no matter how hard I hike. We are always happy to see each other and take a quick snack break together. Then they spread their wings and fly away and I try to keep up with them. But most of the time, I bite their dust and see them either when they break again for lunch, or whenever they set up camp for the night. Their footprints are for me to follow and I feel safe. After 4 days of hiking in the desert heat, we see some strange objects in the distance. When we come closer, we can distinguish the shapes better. It’s a windfarm! 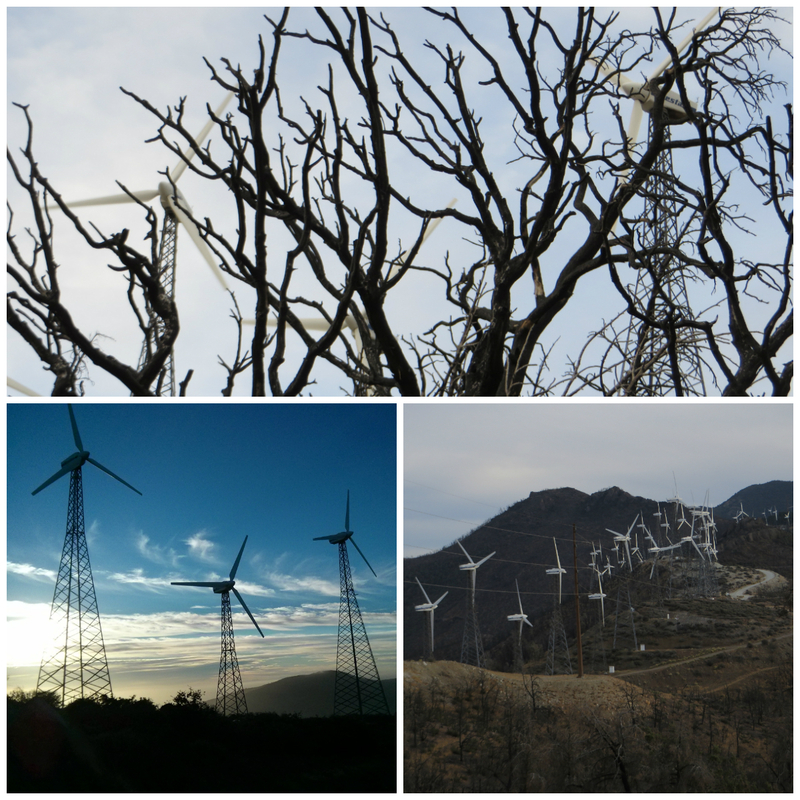 Hundreds of windmills surround us. My Dutch heart is beating faster! Windmills behind the trees. Windmills at dawn. Windmills in a row. Oh yeah, it’s windy too. It’s crazy windy up here. Hence all the mills. In the evening, I try to pitch up my tent but it doesn’t work. It’s too windy here. Aaah, I get super frustrated and I tell Jake and Fox that I am looking for a more secluded space, which I find just around the corner from their tent. 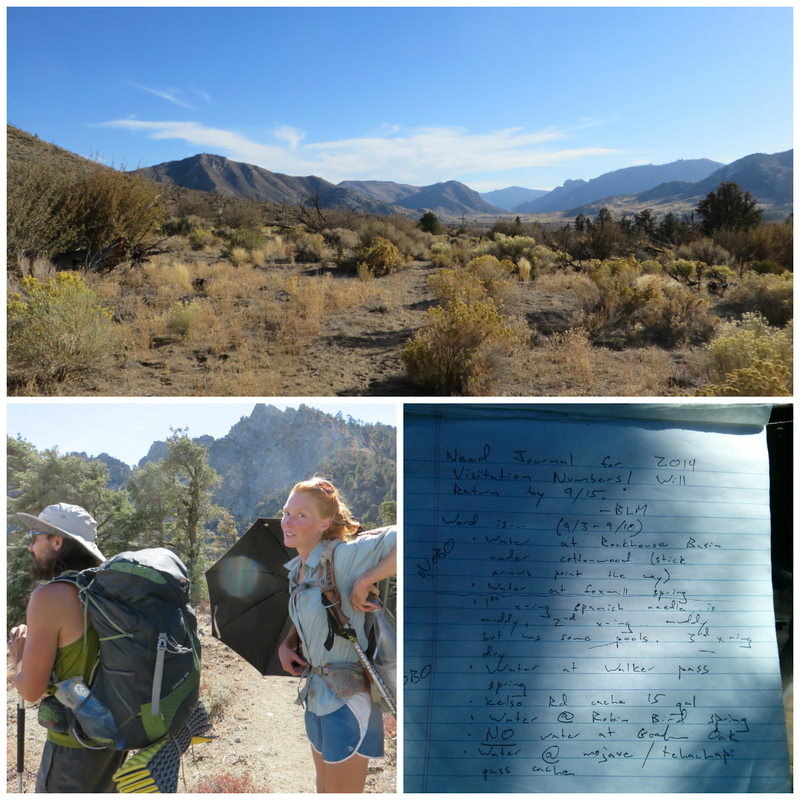 The next morning, it’s only a 10 mile hike to Tehachapi. I check the elevation profile. It’s a flat out hike for the first 4 miles, and the next 6 miles downhill. Oh wow, easy trail, that doesn’t happen often! On town day, I allow myself to fantasize about food and drinks. My cravings are Coca Cola, fresh juice, fruit, and French fries. I can’t wait to get into town and stuff my face. During a long and dull road walk through the windfarm, Jake and Fox catch me. Fast as they are, I only get to see them a brief minute. In the distance, I can see Hwy 58, from where we can hitch into Tehachapi. 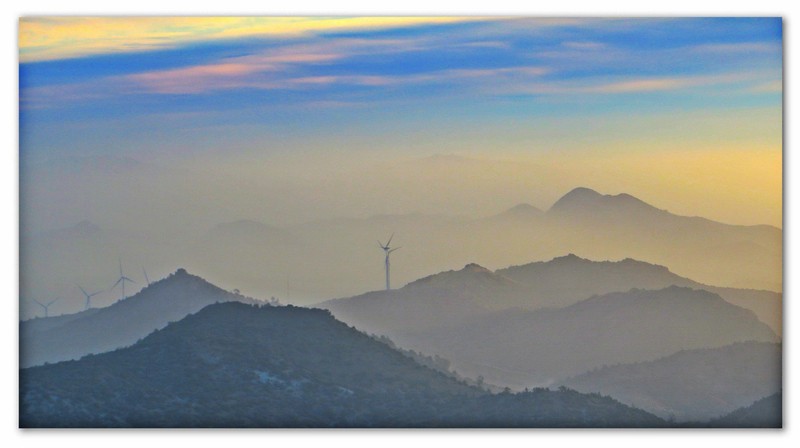 Hazy sky and windmills in the early AM. On the ridge, just before the long descend into Hwy 58, I am facing a storm that is bigger than I ever have experienced in my life. I’m from windy Holland, and this is a huge statement for me. The wind is blowing so hard that I almost get blown off of the ridge. It’s crazy! They didn’t build the windfarm just for fun, that’s for sure! I have a hard time getting down. I feel so frustrated right now. I anticipated on an easy 10 miles, but nothing on this goddamn trail is easy, so it seems. It’s the hardest descend on the trail so far. Fighting the storm, I finally reach the valley floor. The sound of the cars overrules the strong wind. Hitching is not easy here. The cars race past us with full speed. Fox is being a badass at it! But we eventually do get a ride from a lovely couple, who are hikers and mountain rescue workers themselves. First stop is Albertsons, where I buy for over 50 USD worth of food. I order a big bag of fried potato wedges at the deli, and start eating them straight out of the bag, followed by a big bottle of Illy Iced Cappuccino. All this while scanning the isles, searching for more food. 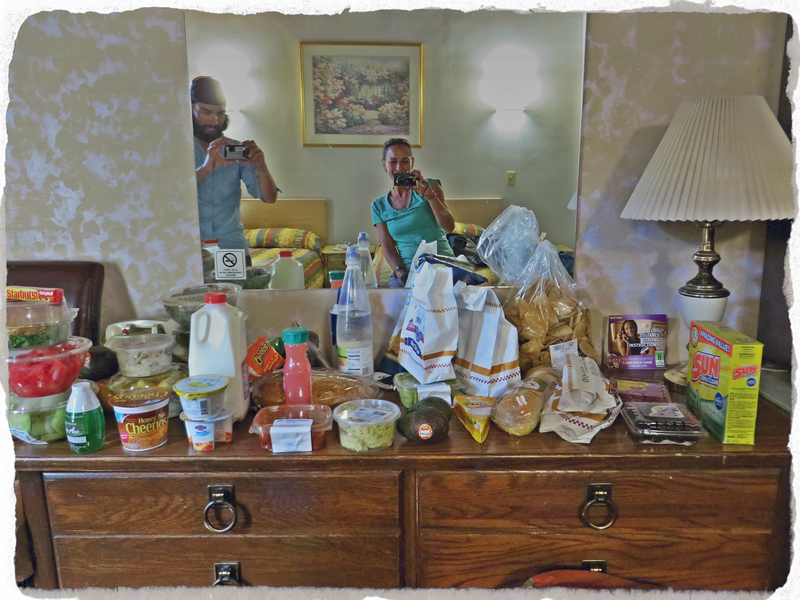 We take the rest of the food with us to our hotel room. We manage to eat ourselves in a deep food coma. Sleep comes fast. Food fest. We eat all this in one attempt. A thru-dinner. I’ve been enjoying your blog. I hope you finish it. Hi India! Thank you for your message. Yes, I’m on it! Haven’t been writing a lot lately, but new stories are coming soon! Stay tuned! hi vi,enjoyed your posts again but what about the last stretch?